The Carrier air knife system provides an efficient means of separating heavy metal, stone, plastics, paper and other debris from aluminum beverage container (UBC) scrap or other low-density materials. Our air knife separator systems can be customized to meet your needs and processes, and are recognized for industry-leading results. Process is intended to reduce residual contaminant build-up in the recycled alloy, reduce furnace melt loss, and recover other recyclable materials from the aluminum such as lead, copper, paper, plastic, etc. The principle involves air separation of lighter materials from heavier free-falling materials. 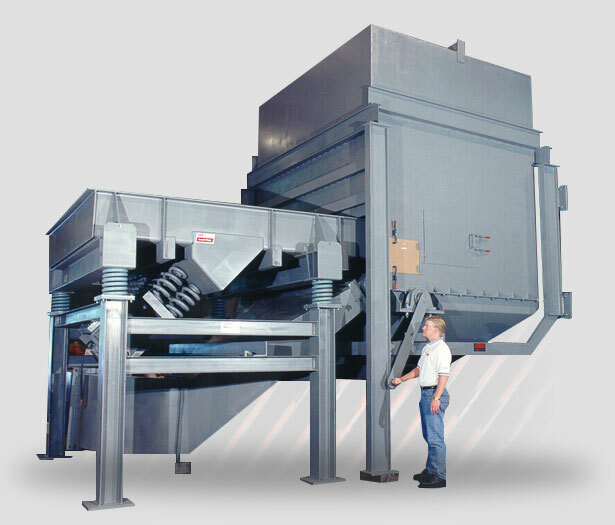 A vibratory feeder is used to transport the material over a high-velocity air knife or curtain. The vibrating action causes finer, heavier materials to migrate to the bottom of the conveyed bed, where they fall through the air curtain and are collected below. 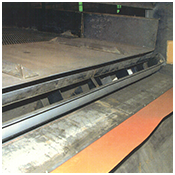 Aluminum and lighter materials are blown across into a separation hopper, where the aluminum falls out onto a collection belt. Dust, paper, plastic and other lighter materials are collected in an exhaust system consisting of a cyclone and/or after-filter. The concept provides a 95% efficient means of cleaning the aluminum scrap and recovery of contaminants with very low energy consumption and low front-end capital expense. Designed to process shredded UBC or whole cans. Standard systems for 15,000, 30,000, and 45,000 PPH. Also removes plastics, paper, and loose dirt from the UBC scrap. Operation places no moving parts in contact with material. Design of system minimizes loss of UBC scrap. Adjustable nozzle assembly for fine-tuning in the field. Laboratory system available for demonstration and testing on actual product.